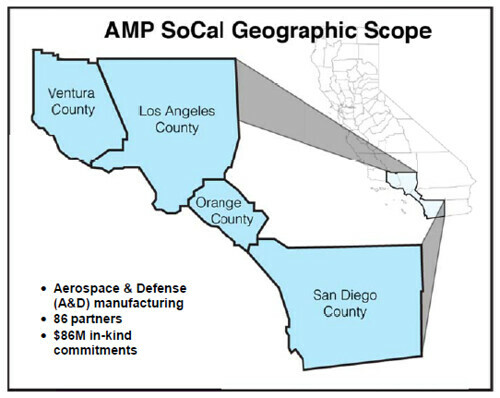 Home > Manufacturing > Aerospace & defense manufacturing coalition goes to D.C.
Aerospace & defense manufacturing coalition goes to D.C.
San Diego’s aerospace and defense industries play a critical role in our regional economy. To further support these key industries, San Diego Regional EDC joined in partnership with 86 dedicated organizations to form the AMP SoCal Coalition to compete for the new federal designation known as the Investment in Manufacturing Community Partnership (IMCP). The AMP SoCal coalition, which stretches from San Diego through Ventura County, was one of only 12 regions across the United States that received this new special grant status from the U.S. Economic Development Administration. The IMCP designation allows 11 federal agencies with $1.3 billion in economic development funds to use the designees’ plans to make targeted investments in demonstrably strong public-private partnerships to strengthen regional manufacturing. Essentially, this opens up AMP SoCal and the 11 other IMCP designees to vie for a piece of this $1.3 billion funding. To ensure the AMP SoCal Coalition puts its best foot forward, San Diego Regional EDC, along with East County EDC President Jo Marie Diamond and other members of AMP SoCal Coalition, participated in a two day conference in Washington D.C. last week. This conference was designed to provide best practices insights for regions that won IMCP designations, while giving attendees direct access to the federal agencies participating in the program including the Department of Defense, Environmental Protection Agency, Small Business Administration, and Department of Transportation. In December, San Diego will be hosting AMP SoCal’s Executive Board meeting to review the IMCP conference and continue to identify regional opportunities to leverage the IMCP status to compete for locally impactful grants.